Effective: SuperTrapeze™ includes the innovative e2™ trapeze handle with a "ladder-like" set of two rails that allows the user to more easily climb up to a sitting position. 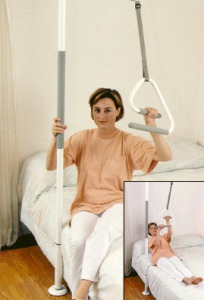 Ease of Use: The combination of a trapeze + bedside pole - the only product to provide COMPLETE support for sitting up, pivoting, and standing up from bed. 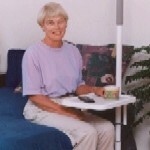 Versatile: Does not require special bed or mounting brackets - works with any bed! 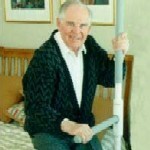 Does not force bed outward from wall as with conventional trapeze systems. 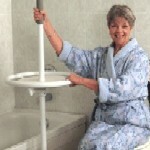 Will install beside waterbeds and electric beds unlike floor mounted trapeze systems. 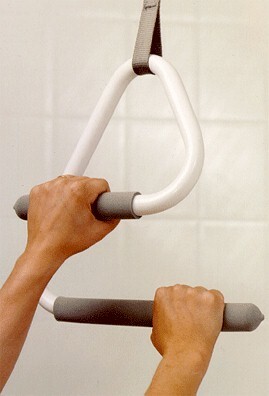 Flexible: Support arm is adjustable in height and angle. Strap is adjustable in length to achieve best height and location of trapeze. Ease of Use: Open design of trapeze handle allows it to be hooked onto pole for storage. SuperTrapeze™: 0.875"/2.2cm diameter, Adjustable 1”/2.5cm nylon strap attaches to welded support arm (adjustable in height on SuperPole™). Support Arm Height Range: 12-22"/ 30-55cm from ceiling. Fixed to the pole with 3 penetrating set screws. Trapeze Handle: overall size 12x12" / 30x30cm. Trapeze Handle: height range 42-70" / 106-178 cm from ceiling.